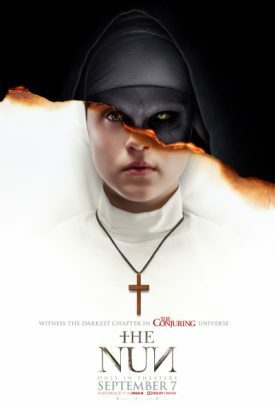 The Nun is the newest installment in the popular Conjuring film series, though you don’t need to have seen the other films to get it. While it certainly isn’t as good as The Conjuring 1 and 2, the film is a suitably fun Haunted House Movie (or, Haunted Abbey Movie in this case), and should satisfy people who enjoy easy, predictable jump scares with friends. Unfortunately, anyone expecting a character-driven story like the first two Conjurings will be sorely disappointed. Father Burke (Demian Bichir) has been sent to an Abbey by the Vatican to investigate a nun’s suicide. He is joined by unavowed novice Irene (Taissa Farmiga, TV’s American Horror Story) and comedic relief guide Frenchie (an enjoyable Jonas Bloquet), and the trio sets off to the abbey unaware of the sinister and supernatural evil that calls it home, namely a ghostly Nun (An effective Bonnie Aarons). I understand why most critics are being harsh on this film. This is a horror series that has stood out from the crowd by providing engaging stories and interesting characters along with effective scares, and this one is more focused on the scares. The characters are not as interesting as they could be, but the performances are good enough to get you through if you like this kind of thing. I’ll likely forget most of the details of this film after writing this review, but I enjoyed watching it with my cousin alone in the dark theater. This should have been a Halloween release, not a Summer one. The dark, gothic design of the Abbey and candle-lit hallways make it perfect for home viewing parties with friends, and there are unexpected bits of humor to lighten the mood (something other films did not have), to good effect. The Nun’s biggest failure is its reliance on predictable jump scares over an engaging story or characters. The camera movement repeats in every scary scene to prepare you for the ghouls to pop out: Shot of the room from the ceiling, then a close-up shot of the character’s face, then the camera slowly turns to reveal the ghost behind them. It’s fun, but seriously predictable and feels longer than its 96-minute runtime. Despite that, I would still recommend renting the film, as there are enough good effects and some good humor to make it a fun ride. Rent it.